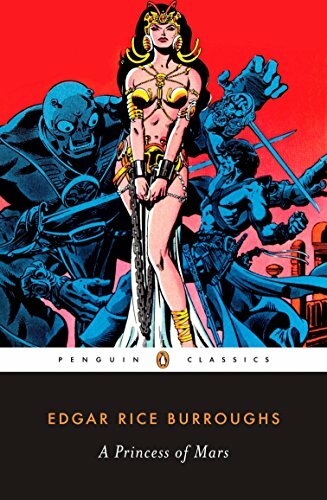 I recently discovered that the back cover of the 2007 Penguin Classics edition of A Princess of Mars by Edgar Rice Burroughs has a prominent blurb by Carl Sagan: "Might it really be possible—in fact and not fancy—to venture with John Carter to the Kingdom of Helium on the planet Mars?" Although the cover does not specify the source of the quote, it's from the "Blues for a Red Planet" chapter from Cosmos; references to his being a fan of the John Carter books since first reading them as a kid appear scattered throughout Sagan's writings, including an anecdote about obtaining a related vanity plate (due to a limit of 6 letters per plate, he had to settle for "PHOBOS" instead of his first choice, "BARSOOM"). And this hasn't been the first time that Burroughsians have noticed Sagan; for instance, consider the Burroughs fansite ERBzine's lengthy tribute to Sagan.